When I was reading up on inoculating logs with shiitake mycelium, recommendations on log sizes varied widely, ranging from 3 to 12 inches in diameter. 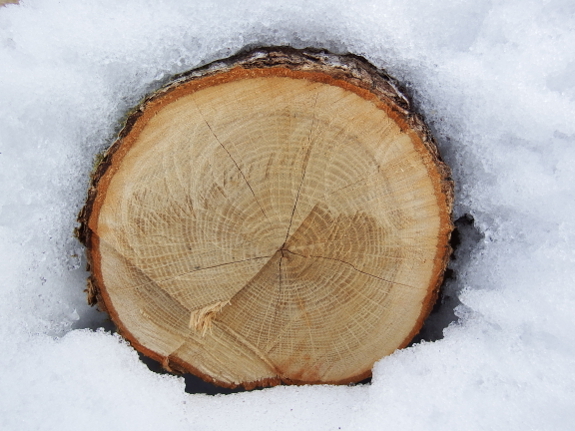 Large logs tend to fruit longer and to hold moisture better during dry spells. On the other hand, small logs fruit faster and are easier to wrangle (especially if you plan to soak logs to force fruiting). One factor I didn't read about, but soon thought of once I started looking at the logs Mark cut for me, is the sapwood-to-heartwood ratio. Shiitakes only eat the sapwood, the pale-colored wood around the outer perimeter of the log. And bigger logs, especially if they grew slowly in woodland settings, might have three quarters of their volume made up of useless heartwood, leaving the fungi far less food than you might think. 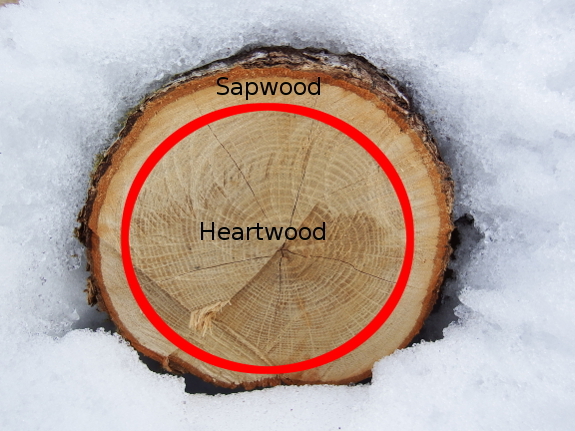 In case you can't pick out the sapwood in the first photo in this post, here's a labeled diagram to get you started. This log has been sitting around for a couple of weeks --- the color difference is even more evident in the wet wood of a newly cut log. Looking closely at my logs got me thinking that maybe the puny 3-inch treetops that I had earmarked for firewood are actually better mushroom logs than these huge logs that I'd originally considered prime fungi fodder. In fact, the smaller-diameter logs have no heartwood at all, so they might contain nearly as much sapwood as the log pictured above. Assuming I'm willing to keep logs moist over the summer with sprinklers, perhaps little logs are the way to go after all? The decision will have to be made soon because spring weather is finally upon us! Highs in the forties and lows in the twenties means it's finally safe to pull the mycelium out of the fridge and inoculate those logs. Time to enjoy the March Into Spring! Wouldn't bigger trees need more sapwood? Assuming a cilindrical tree piece, the volume of sapwood would be the length of the piece times the surface area of the cross-section. 1/4 of a 12 in tree is a cross-section of 1/4·π/4·12² = 28 in², while the whole cross section of a 3 in tree is only π/4·3² = 7 in². And even is you have a 12 in tree and only the outer inch is sapwood, that would still be π/4·(12² - 11²) = 18 in². Amusingly, when I was telling this to Mark, he said that, obviously, we needed to find a way to cut out the heartwood and grow mushrooms so they can pop out on the interior of the mushroom log! That would definitely look cool and would save my "waste" firewood dilemma, but I suspect the tools involved would be way beyond the homestead level. Not necessarily. If the logs would be short enough to fit upright in a bandsaw, it you could cut off the sapwood relatively easily. Keep in mind that it's perfectly feasable to build your own bandsaw. And even with simple hand tools you could hollow out a log. It would just take a lot more time. Use a spoon drill; like in this 1923 film starting at 2:30. Or even faster using a foot-powered spring-pole lathe (bowl turning video from the aptly named "Robin Wood"; not a joke). Look how big that bowl is. Both of these technologies have existed for at least hundreds if not thousands of years. Mr Wood not only built his own lathe but also forged his own tools. On the other hand; would the sapwood need to be in one piece? Could you chop off the sapwood with an axe, giving the fungus a lot more surface area to work with? As I recall you mentioned using bags of sawdust once in a book review.